The same thing goes through everyone’s head when they’re planning a vacation to Spain. Sure, you want to see the fairytale hilltop towns, roam the bustling cities, and sample the world’s greatest tapas scene. Then, there’ll come a time when all you’ll want to do is flop on some sand -- preferably soft and golden -- with the sound of waves breaking in your ears and a hot sun blazing overhead. Sheesh, you don’t ask for much, do you. You have your pick of other Mediterranean beach destinations: Italy’s miles of coastline and Greece’s sneeze-pattern of island hotspots are strong competition. But if you want ace paella to go with your sunny afternoon wake-up calls, the choice has got to be Iberia. So here they are -- the best beaches in one of the best beach countries in Europe. You’ve got your snorkeling hotspots, your cliff-jumping coves, and your nudist idylls, and now, it’s time to get your swim on. For those of you whose Catalan is a little rusty, “Aiguablava” translates as “blue water” -- and there are no prizes for guessing where that name came from. 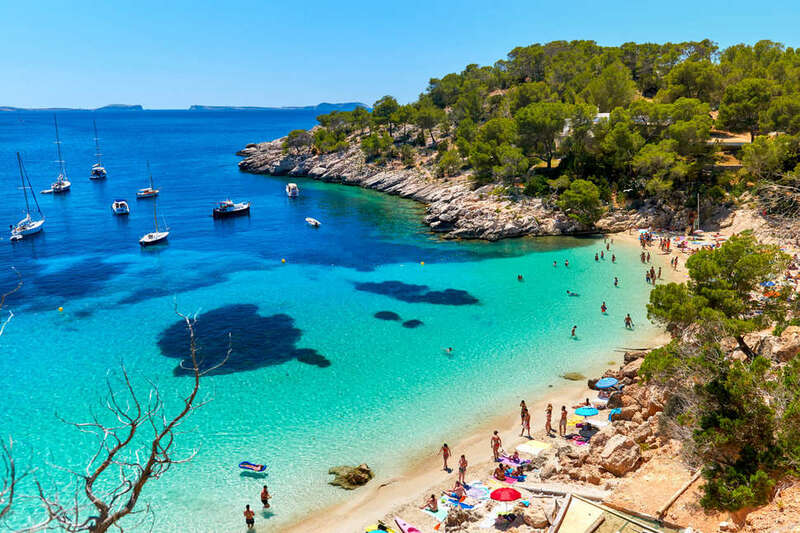 This is the jewel of the Costa Brava, and a prime pick for families: The beach slopes gently into shallow water, and ice cream is never far away with restaurants and shops nearby. 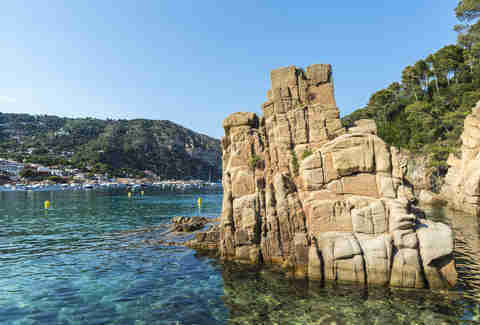 To mix it up, head along the Begur coast to La Piscina Natural Es Cau, a saltwater swimming pool carved out the rock. 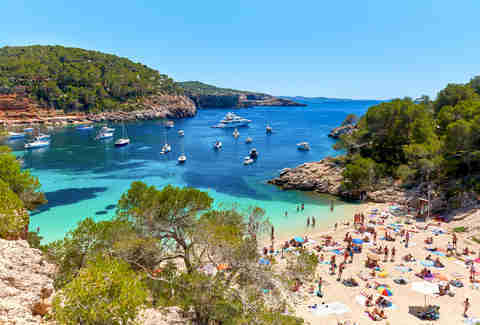 When you’ve got a killer hangover and last night’s bass still thumping in your skull, Cala Salada is the remedy your body is crying out for. The water has an almost lagoon-level of calmness, and the cove is secluded enough to keep away the masses, so you needn’t worry about the dreaded LOUD NOISES. Take a dip in the cool blue water, or go big with a jump straight from the cliffs. The old-school beach café serves a moreish seafood paella -- just make sure you’re in a fit enough state to keep it down. 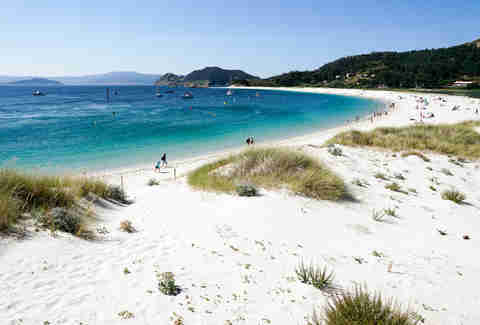 The Las Cies Islands are Spain’s best impression of the Seychelles, which makes it all the more surprising that more tourists don’t make it here. The beach-in-chief is Rodas, a crescent-shaped strip of white sand that stretches for nearly a mile between two islands (Monteagudo and Faro). The whole archipelago is a national park, which means there’s not a car or a high-rise hotel sight. This dune-backed cove on the southeastern edge of Mallorca is as much about what’s around as it is about the beach itself. The Mondragó Natural Park coaxes sunbathers away from the sand with virgin pine forests, easy-going coastal hikes and the chance to see peregrine falcons sweeping through the air. The water off-shore is a favorite hangout for shoals of pretty fish, so pack your snorkel. This beach is no secret, so expect it to be busy in peak season -- to escape the crowds, try the roomier S'Aramador beach nearby. 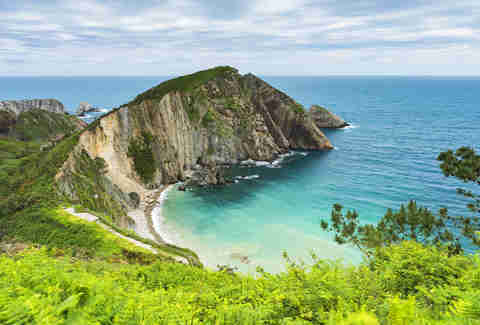 This bay on the north coast of Spain has got more drama than an episode of Dallas -- silvery sand and stones sweep around a sheer cliff face, backed by verdant meadows. The calm, high-vis water makes it a prime spot for snorkeling -- just watch out for the rocky ground underfoot. This is the beach that all the other beaches have got a secret crush on. It’s got it all: dazzling white sand, sparkling turquoise water, and a gourmet restaurant scene that guarantees a good meal (salt-baked fish is the local specialty). In the height of summer the crowds come to play, so get there early to secure your own spot. Oh, and by all means get your suit off -- it’s encouraged. At high tide, you wouldn’t know it, but here lies a geological wonder that will impress even those people who think they’re too cool to be impressed by geological wonders. 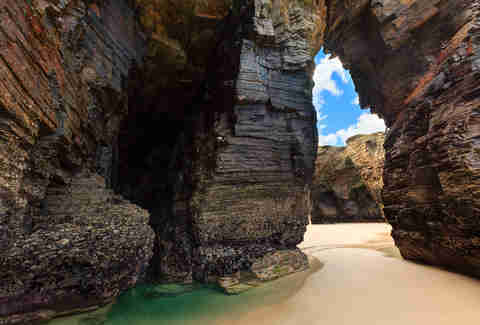 When the sea recedes, it reveals rock arches up to 90 feet in height, and eerie sea caves eroded into the hillside. Nature loves a magic trick. Jonathan Melmoth is a writer based in Brooklyn, New York. Find him on Instagram @mistermoho.